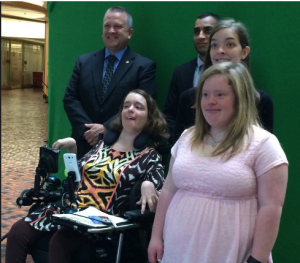 The statewide #IWantToWork campaign visited the state Capitol Tuesday to raise awareness about funding for Pennsylvania’s Office of Vocational Rehabilitation–and to take selfies with legislators. The campaign, which is staffed by young people with disabilities, is pushing for the General Assembly to pass a bill that would appropriate $23 million in state and federal funds for the Office of Vocational Rehabilitation in the final budget. The funding would help the Office of Vocational Rehabilitation place disabled youth into part-time or summer jobs. 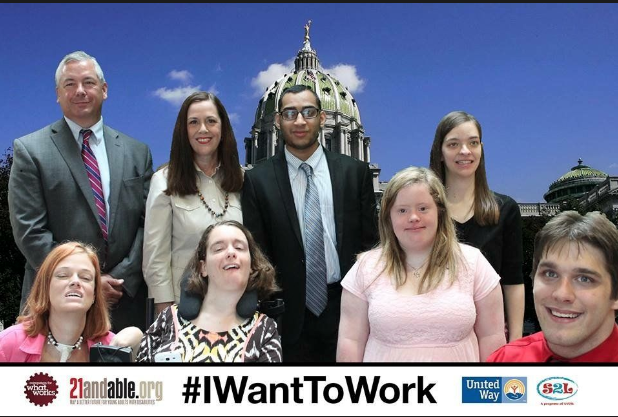 “The real focus is on making sure young adults with disabilities have employment opportunities before they graduate school,” said Dr. Josie Badger, #IWantToWork’s campaign manager. According to the campaign, 65 out of 100 Pennsylvanians with disabilities can’t find jobs or have stopped looking for work. Badger explained that most disabled youth usually don’t have any sort of work experience until the semester before they graduate. By that point, their non-disabled peers have already had job experience with a summer or part-time job. During the event, #IWantToWork set up a green screen for their “Selfie Day” with a Tap Snap booth that captured photos of legislators, staffers, and advocates. The booth then automatically uploaded the photos to the group’s social media accounts. #IWantToWork’s social media director, Louis Hall, said the campaign has been gaining momentum online. Hall said the campaign knew that the best way to reach youth was through social media, but that it also generated interest among legislators as well. “We’ve had retweets from almost every senator that co-sponsored our bill,” Hall said, who also noted some have tweeted selfies holding the #IWantToWork campaign sign. “The recognition from policy makers on our bill is pretty amazing considering how many bills they have to follow,” Hall said. The bill passed unanimously in the House and is before the Senate now. Gov. Tom-Wolf has endorsed the full funding of the program in his budget proposal.